The Monte Cristo Bar Stool by Cast Classics perfectly merges indoor style and comfort with outdoor strength and toughness. The traditional, never-ending loop design on this barstool will always be in vogue, and is stylish enough to be used indoors. The Monte Cristo Series offers Outdoor Furniture that's hand-crafted with unsurpassed quality and attention to detail, and solid-cast aluminum that's rust-free, light weight, cooler than iron and virtually maintenance free. These Outdoor Bar Stools are strong, with fully-welded frames, a nine-step finishing process and a U.V. inhibitor in the powder coat that offers many years of fade-resistant, outdoor use. 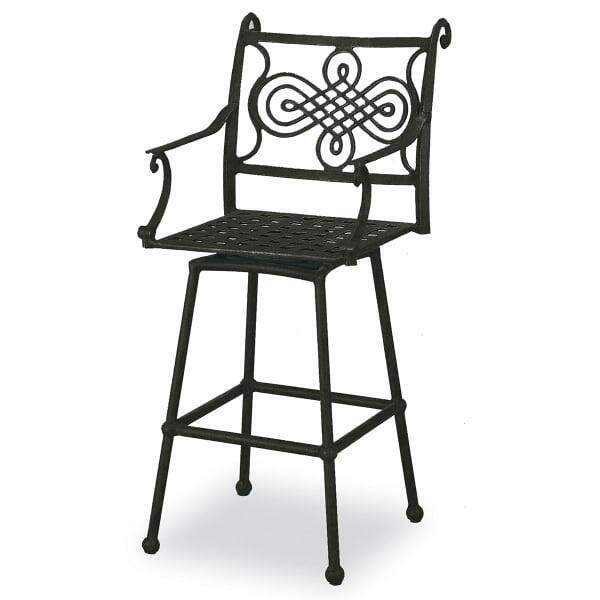 Showcase style and durability on your deck, patio or sunroom with the Monte Cristo Outdoor Barstool by Cast Classics! Contact Family Leisure today! Take your patio to a whole new level with outdoor living items from Family Leisure. From cast to wicker and everything in between we are your one stop shop for all of your patio needs.